The statistic represents the amount of selected materials generated in the municipal waste stream in the United States between 1960 and 2015. Around 68,050 tons of paper and paperboard were generated in 2015. Municipal solid waste is commonly known as the garbage produced from everyday items from households, the commercial industry, and institutions. 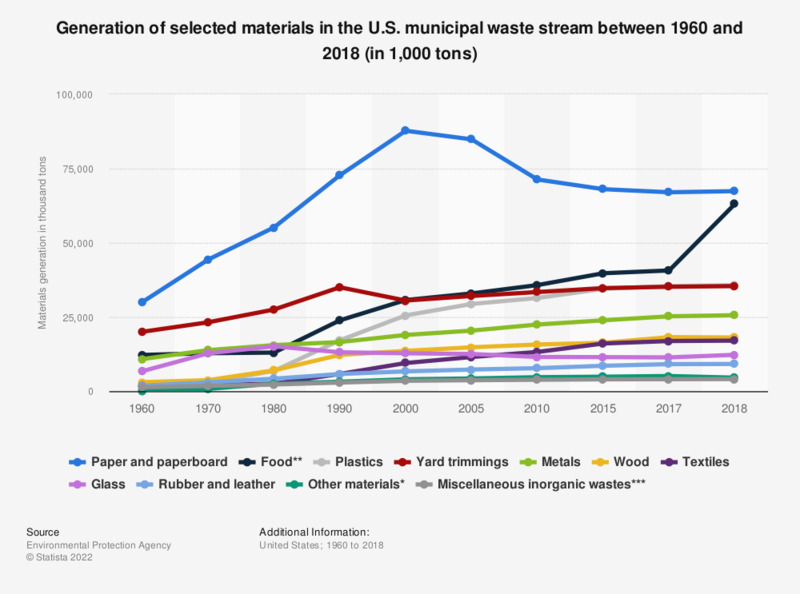 In total, the United States has increased its production of municipal solid waste from 88.1 million tons in 1960 to some 262.4 million tons in 2015. Since the 1960s, municipal waste in the United States has always been primarily paper and paperboard materials. In 2015, the country produced 68.1 million tons of paper and paperboard waste. The ability to recover paper and paperboard waste has steadily increased, reaching 65.8 percent in 2017. However, a large portion of tissue products and retained documents are unrecoverable due to the thousands of chemicals contained within the fibers that could contaminate newly manufactured paper products. Another fraction of paper waste is disposed of in landfills, despite being potentially recoverable. A lack of collection infrastructure, poor recycling habits, or a lack of awareness are usually the main reasons that waste is not recovered. Paper materials can often be re-used for recycled paper and other products. The United States is also one of the largest producers of paper materials worldwide. According to the source, figures do not include construction and demolition debris, industrial process waste, or certain other waste streams. Generation before materials recovery or combustion. Other materials include electrolytes in batteries and fluff pulp, feces and urine in disposable diapers.